Lloyd, our Media and Communications Manager, met up with Chris from Centre Church this week as he is planning on running the Brighton Marathon for us in April. Hello Chris, please give us a bit of background about yourself and what you do in the city? “I’ve been in Brighton for 3 and a half years. 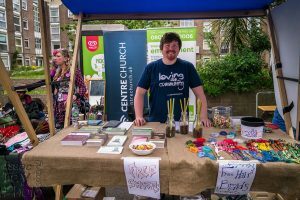 I moved down from Manchester to get involved in a small church plant called Centre Church, which is in the Kemp Town area. I felt a real sense of the calling of God on my life to get involved in Brighton, and to see His kingdom established in places where it’s not already. How did you find out about the work of the Brighton and Hove City Mission? 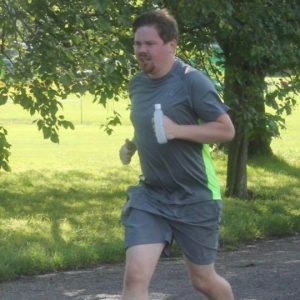 “I started running in February 2015 as a way to lose a bit of weight. I noticed that I was overweight, well, quite overweight, and I needed to do something to sort it out. I was at the stage where if you forgot your keys and have to run back up the stairs to get them, you have to take a second to breathe at the top as you are so out of breath! That’s not a good condition to be in, especially as I was still in my twenties at that time! With my thirtieth coming up, I thought that it is time to sort this out, it’s time to get a bit fitter and more active! 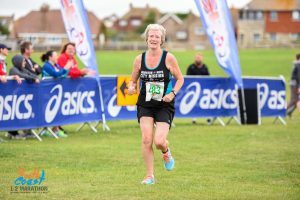 So you have chosen to run the Brighton Marathon in April! So you chose to support us, thank you so much, why did you chose us? Did you have a target to reach, how are you getting on? Thank you Chris, we look forward to seeing how you get on. 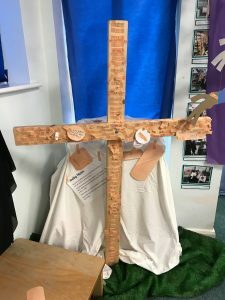 The library at St Peter’s Catholic Primary school was transformed into a pathway for prayer. As the children entered the space wide eyed and full of wonder, they began a journey through the room, exploring creative and physical ways to pray. The areas they experienced included thinking about themselves, any worries they might have, making a change, coping with their emotions, loving others, and caring for those in need. They joined in with activities that helped them consider the world and the places where there is conflict and they considered unity. The lesson time ended with inviting the children to pray using their hands. They could hold up their thumb, as it’s closest to us we pray for those we love. 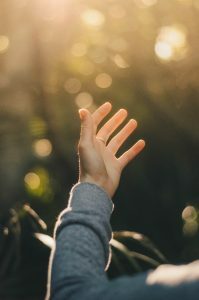 The forefinger reminds us to pray for those who teach. The tallest finger helps us to pray for leaders here in our City, Country and across the world. Our ring finger is the weakest, where we pray for those in need. Lastly with our little finger, which is the nearest to us, helps us to pray for ourselves. Lunchtime was popular as children revisited areas they enjoyed. The children said that they enjoyed a time to reflect and be calm. Teaching staff said quieter children had space to explore equally and that they also valued the time spent together. Everyone is looking forward to seeing the space transformed another time. Bev, our Rest Homes Team Leader, and Nicky, our Fundraiser, are running the Brighton Half Marathon in aid of the City Mission. We caught up with Bev to see how she is getting on. “I started running about 13 months ago, and completed my first 5k on Christmas Eve 2016, so it’s been a new venture, and I’m gradually building up my distances. I regularly do ParkRun, and I’ve notched up 33 so far, it’s certainly a good experience to build up the run threshold each week. I am going to be running my first ever half marathon on 25th February. I did two 10k’s last year, the first one I did ever was in September and another in November, but I’m upping the stakes and now doing a half marathon, which also happens to be on my 34th wedding anniversary! What a way to celebrate! I’m on target with my training, keeping up with the half marathon’s training schedule, and last week I did a nine mile run. I haven’t set myself a target of how much I want to raise, I just want to raise as much as I can really. Lots of very kind and generous people gave towards my 10k last year, so to increase what I got last year and build on that would be fantastic. Thank you so much Bev and Nicky. We are looking forward to hearing more about the run soon! We have kindly been given 2 tickets for a ride on the British Airways i360. This would make a fantastic valentines gift for your significant other. Please send your bid to nicky@bhcm.org.uk, and bidding will end on the Sunday 4th February, and the winner will be announced 5th February. Thank you so much British Airways i360 in supporting us, and helping us raise money for the work of the city mission.